Journal of the House of Lords: Volume 7, 1644. Originally published by His Majesty's Stationery Office, London, 1767-1830. Answers from the H. C.
Letter from Dr. Walker, the Parliament's Agent in Flanders, about an Outrage committed on the Imperial Minister here. E. of Stamford to have a Moiety of 3000l. he discovered of Sir T. Darrell's, and the other to be paid to the Reformado Officers. Message to the H. C. concerning it's about the Outrage committed on the Imperial Minister; and to remind them of Murry's Petition. Ld. North, Leave to be absent. Ordinance to augment the Living of Bennet Finks out of the Revenues of the Dean, &c. of Windsor. Royston sent for, for selling a Libel, called The Soldiers Catechism. Letter from Ld. Howard of Chariton. Preachers at the Fast thanked. Message from the H. C. with an Ordinance. Causeway at the Parliament Stairs. Lady Savile, Leave to the her Husband, and his close Imprisorment remitted. 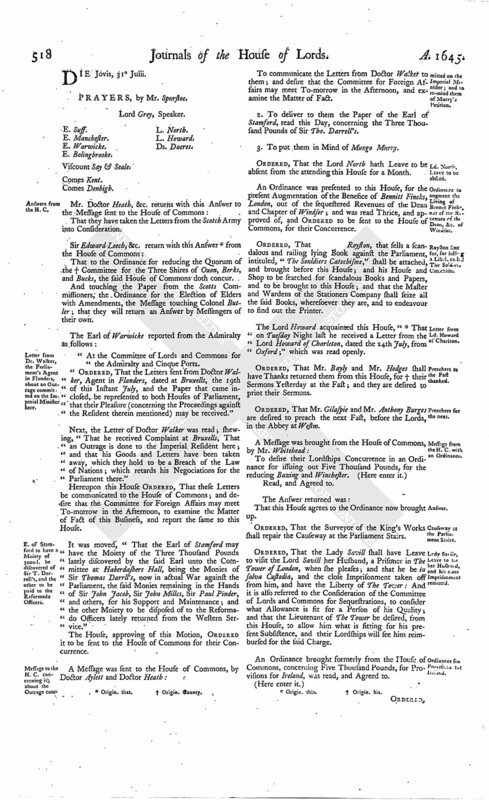 Ordinance for Provisions for Ireland. Dr. Brownrig to be released on Bail. Dutch Officers under the E. of Essex, Arrears. Capt. Church's Petition, for Money advanced for Cloathing, &c. for his Men in Colerayne. 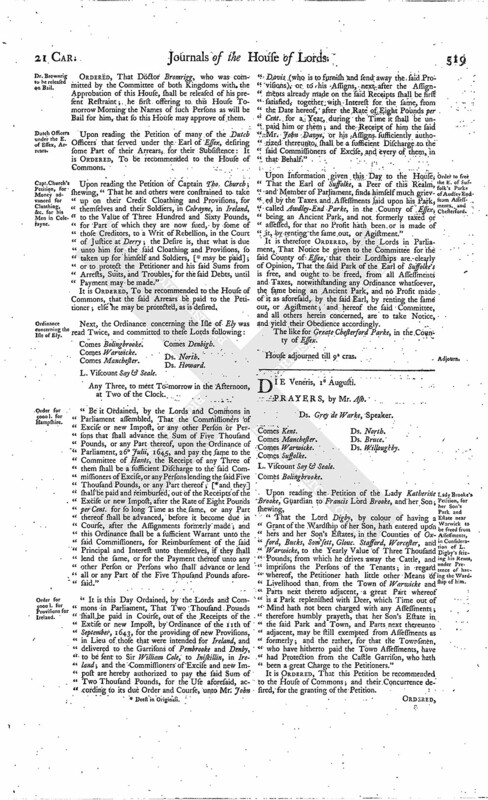 Ordinance concerning the Isle of Ely. Order for 5000l. for Hampshire. Order for 5000l. for Provisions for Ireland. Order to free the E. of Suffolk's Parks of Audley End from Assessments, and Chesterford. That they have taken the Letters from the Scotch Army into Consideration. That to the Ordinance for reducing the Quorum of the (fn. 2) Committee for the Three Shires of Oxon, Berks, and Bucks, the said House of Commons doth concur. And touching the Paper from the Scotts Commissioners, the Ordinance for the Election of Elders with Amendments, the Message touching Colonel Butler; that they will return an Answer by Messengers of their own. "At the Committee of Lords and Commons for the Admiralty and Cinque Ports. "Ordered, That the Letters sent from Doctor Walker, Agent in Flanders, dated at Bruxells, the 19th of this Instant July, and the Paper that came inclosed, be represented to both Houses of Parliament, that their Pleasure (concerning the Proceedings against the Resident therein mentioned) may be received." Next, the Letter of Doctor Walker was read; shewing, "That he received Complaint at Bruxells, That an Outrage is done to the Imperial Resident here; and that his Goods and Letters have been taken away, which they hold to be a Breach of the Law of Nations; which retards his Negociations for the Parliament there." Hereupon this House Ordered, That these Letters be communicated to the House of Commons; and desire that the Committee for Foreign Affairs may meet To-morrow in the Afternoon, to examine the Matter of Fact of this Business, and report the same to this House. It was moved, "That the Earl of Stamford may have the Moiety of the Three Thousand Pounds lately discovered by the said Earl unto the Committee at Haberdashers Hall, being the Monies of Sir Thomas Darrll's, now in actual War against the Parliament, the said Monies remaining in the Hands of Sir John Jacob, Sir John Milles, Sir Paul Pinder, and others, for his Support and Maintenance; and the other Moiety to be disposed of to the Reformado Officers lately returned from the Western Service." The House, approving of this Motion, Ordered it to be sent to the House of Commons for their Concurrence. To communicate the Letters from Doctor Walker to them, and desire that the Committee for Foreign Affairs may meet To-morrow in the Afternoon, and examine the Matter of Fact. 2. To deliver to them the Paper of the Earl of Stamford, read this Day, concerning the Three Thousand Pounds of Sir Tho. Darrell's. 3. To put them in Mind of Mungo Murry. Ordered, That the Lord North hath Leave to be absent from the attending this House for a Month. An Ordinance was presented to this House, for the present Augmentation of the Benefice of Bennitt Fincks, London, out of the sequestered Revenues of the Dean and Chapter of Windsor; and was read Thrice, and approved of, and Ordered to be sent to the House of Commons, for their Concurrence. Ordered, That Royston, that sells a scandalous and railing lying Book against the Parliament, intituled, "The Souldiers Catechisme," shall be attached, and brought before this House; and his House and Shop to be searched for scandalous Books and Papers, and to be brought to this House; and that the Master and Wardens of the Stationers Company shall seize all the said Books, wheresoever they are, and to endeavour to find out the Printer. The Lord Howard acquainted this House, " (fn. 3) That on Tuesday Night last he received a Letter from the Lord Howard of Charleton, dated the 24th July, from Oxford;" which was read openly. Ordered, That Mr. Bayly and Mr. Hodges shall have Thanks returned them from this House, for (fn. 4) their Sermons Yesterday at the Fast; and they are desired to print their Sermons. Ordered, That Mr. Gilaspie and Mr. Anthony Burges are desired to preach the next Fast, before the Lords, in the Abbey at Westm. That this House agrees to the Ordinance now brought up. Ordered, That the Surveyor of the King's Works shall repair the Causeway at the Parliament Stairs. Ordered, That the Lady Savill shall have Leave to visit the Lord Savill her Husband, a Prisoner in The Tower of London, when she pleases; and that he be in salva Custodia, and the close Imprisonment taken off from him, and have the Liberty of The Tower: And it is also referred to the Consideration of the Committee of Lords and Commons for Sequestrations, to consider what Allowance is fit for a Person of his Quality; and that the Lieutenant of The Tower be desired, from this House, to allow him what is fitting for his present Subsistence, and their Lordships will see him reimbursed for the said Charge. An Ordinance brought formerly from the House of Commons, concerning Five Thousand Pounds, for Provisions for Ireland, was read, and Agreed to. Ordered, That Doctor Bromrigg, who was committed by the Committee of both Kingdoms with the Approbation of this House, shall be released of his present Restraint; he first offering to this House Tomorrow Morning the Names of such Persons as will be Bail for him, that so this House may approve of them. Upon reading the Petition of many of the Dutch Officers that served under the Earl of Essex, desiring some Part of their Arrears, for their Subsistence: It is Ordered, To be recommended to the House of Commons. Upon reading the Petition of Captain Tho. Church; shewing, "That he and others were constrained to take up on their Credit Cloathing and Provisions, for themselves and their Soldiers, in Colrayne, in Ireland, to the Value of Three Hundred and Sixty Pounds, for Part of which they are now sued, by some of those Creditors, to a Writ of Rebellion, in the Court of Justice at Derry; the Desire is, that what is due unto him for the said Cloathing and Provisions, so taken up for himself and Soldiers, [ (fn. 5) may be paid]; or to protect the Petitioner and his said Sums from Arrests, Suits, and Troubles, for the said Debts, until Payment may be made." It is Ordered, To be recommended to the House of Commons, that the said Arrears be paid to the Petitioner; else he may be protected, as is desired. L. Viscount Say & Seale. Comes Denbigh. Any Three, to meet To-morrow in the Afternoon, at Two of the Clock. "Be it Ordained, by the Lords and Commons in Parliament assembled, That the Commissioners of Excise or new Impost, or any other Person or Persons that shall advance the Sum of Five Thousand Pounds, or any Part thereof, upon the Ordinance of Parliament, 26 Julii, 1645, and pay the same to the Committee of Hants, the Receipt of any Three of them shall be a sufficient Discharge to the said Commissioners of Excise, or any Persons lending the said Five Thousand Pounds, or any Part thereof; [ (fn. 5) and they] shall be paid and reimbursed, out of the Receipts of the Excise or new Impost, after the Rate of Eight Pounds per Cent. for so long Time as the same, or any Part thereof shall be advanced, before it become due in Course, after the Assignments formerly made; and this Ordinance shall be a sufficient Warrant unto the said Commissioners, for Reimbursement of the said Principal and Interest unto themselves, if they shall lend the same, or for the Payment thereof unto any other Person or Persons who shall advance or lend all or any Part of the Five Thousand Pounds aforesaid." "It is this Day Ordained, by the Lords and Commons in Parliament, That Two Thousand Pounds shall be paid in Course, out of the Receipts of the Excise or new Impost, by Ordinance of the 11th of September, 1643, for the providing of new Provisions, in Lieu of those that were intended for Ireland, and delivered to the Garrisons of Pembrooke and Denby, to be sent to Sir William Cole, to Iniskillin, in Ireland; and the Commissioners of Excise and new Impost are hereby authorized to pay the said Sum of Two Thousand Pounds, for the Use aforesaid, according to its due Order and Course, unto Mr. John Davis (who is to furnish and send away the said Provisions), or to his Assigns, next after the Assignments already made on the said Receipts shall be first satisfied, together with Interest for the same, from the Date hereof, after the Rate of Eight Pounds per Cent. for a Year, during the Time it shall be unpaid him or them; and the Receipt of him the said Mr. John Davys, or his Assigns sufficiently authorized thereunto, shall be a sufficient Discharge to the said Commissioners of Excise, and every of them, in that Behalf." Upon Information given this Day to the House, That the Earl of Suffolke, a Peer of this Realm, and Member of Parliament, finds himself much grieved by the Taxes and Assessments laid upon his Park, called Awdley-End Parke, in the County of Essex, being an Ancient Park, and not formerly taxed or assessed, for that no Profit hath been or is made of it, by renting the same out, or Agistment." It is therefore Ordered, by the Lords in Parliament, That Notice be given to the Committee for the said County of Essex, that their Lordships are clearly of Opinion, That the said Park of the Earl of Suffolke's is free, and ought to be freed, from all Assessments and Taxes, notwithstanding any Ordinance whatsoever, the same being an Ancient Park, and no Profit made of it as aforesaid, by the said Earl, by renting the same out, or Agistment; and hereof the said Committee, and all others herein concerned, are to take Notice, and yield their Obedience accordingly. The like for Greate Chesterford Parke, in the County of Essex.